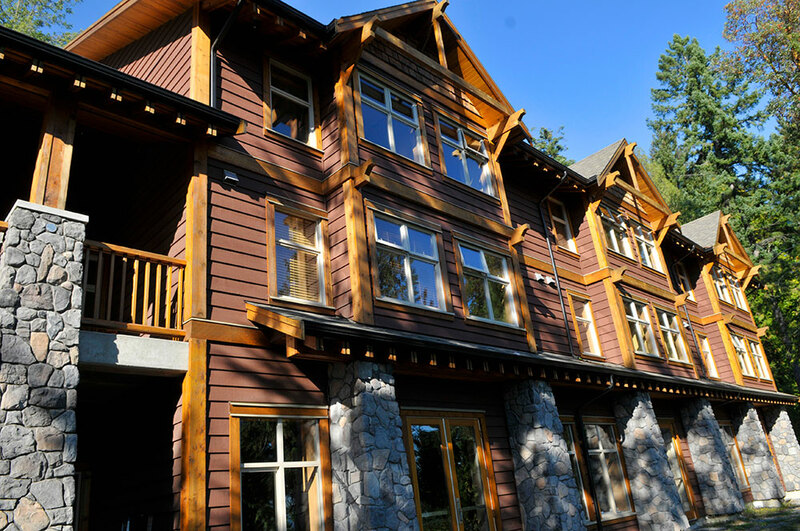 The Kaléo program is housed in the Pacific Woods Lodge, which is located at the heart of Camp Qwanoes and looks out onto forest and ocean views. Students can enjoy beautiful British Columbia sights right from the window seats in their rooms. Each room is shared by up to four students and has its own bathroom, shower, phone, and wifi. Room furnishings include beds, dressers, a closet, and a desk and chair for each student. The spacious classroom in the Fireside Lounge of the Pacific Woods Lodge has a great view of the ocean and includes a small library and study area. All meals are provided, whether on-site or during adventure trips. Students will often share the dining room in the Sky Ridge Lodge with staff, retreat guests and campers, or with guest groups. The food services team serves quality home-style meals and seeks to offer a healthy variety of foods. Vegetarians and those with special dietary needs are accommodated. There are several computer stations in the lodge that are used for practical, communication, and research purposes in accordance to our special media policy for the year. Many students bring their own computers as well to aid in academic studies. Students are welcome to bring their own cars, which will be parked in a lighted area of the main parking lot. There are coin-operated laundry facilities available in the Pacific Woods Lodge. Post mail is delivered to Qwanoes and sent out daily.